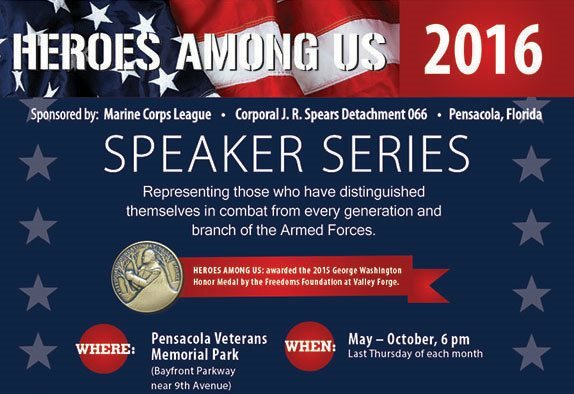 Join us July 28 at 1800 (6:00 PM) at our very own Veterans Memorial Park for our third installment in our Heroes Among Us Speaker Series. The third installment in the series, "Coast Guard Night,” is presented by Cpl JR Sears Detachment 066 of the Marine Corps League. The Marine Core League intends to honor all those Coast Guardsman who have served our nation with honor in both war and peace, with special remembrance of their daring rescues at sea. Guests of honor will be LCDR Vince Jansen and BMC Melvin Zebrowski, USCG. The first Guest of Honor, LCDR Vince Jansen USCG, is currently the USCG Aviation Safety Instructor at the Naval School of Aviation Safety. LCDR Jansen is a graduate of the Coast Guard Academy with previous tours of duty including law enforcement and SAR operations. In 2012, he was selected as the USCG Pilot of the Year by the Order of Daedalians and received the "Masters Medal” from the Guild of Air Pilots and the Air Navigators in the United Kingdom for rescues conducted in Alaska. The second Guest of Honor, BMC Melvin Zebrowski USCG, is the commander of his second unit, the Aids to Navigation Team in Pensacola. During his 20 year career, multi-mission assignments included Executive Petty Officer tours at Station Wachapreague. VA and Aids to Navigation Team Eufaula, AL. He also served duty at the Marine Safety Office in Jacksonville, FL, and Station Barnegat Light. His shipboard assignments included the CGC KEY LARGO and CGC OCRACOKE, in Puerto Rico, focusing on SAR and Law Enforcement operations. This incredible monthly series started in 2013 and represents those who have distinguished themselves in combat. It features stories from every generation and branch of the Armed Forces. The goal is to let people share their experiences with others to create a greater understanding of what life is like before, during, and after combat. In doing so, this series of shared experience provides education and outreach to our community. The Veterans Memorial Park collects donations for its "Marines in Distress" fund, which provides a hand up- not a handout- to military veterans who need assistance. The community has helped to raise $70,000 so far for this worthy cause. The Veterans Memorial Park Foundation depends on individual donations, from people just like you, to support our park. You can easily donate here.